Scoop approximately 1 2/3 tbs. of cookie batter, yogurt, and other soft foods using this purple, 0.75 oz. #40 disher. Its color-coded handle makes capacity classification and portion control a breeze when serving hot or cold foods in your restaurant, cafeteria, or bakery! Perfect for scooping 1.5 Tablespoons of cookie dough. Handle isn't as great of a quality as you'd expect but it does the job and you can't beat the price. Great little scoop. We use all the time for different baking. We use for our mini whoopie pies and we have not had any issues! The perfect size disher for pancakes. It allows for us to create consistent pancakes when we have a breakfast rush and they are extremely durable as well. The perfect disher for smaller sized items. Very good quality product! The sizing is exactly as advertised and it is very sturdy. I am very confident It will last a long time. This is a great sized disher for small cookies. It holds up pretty well to heavy doughs (will eventually break). The handle is comfortable to hold. These dishes are great. They are great for portioning. The only thing they need to make now are lids that fit on food pans that also have a notch that fits the handle of these! This is an excellent quality utensil for the price point. Very well built, strong, and solid product. This is a great value for your dollars spent. This product is excellent for portion control. Ideal for dishing up smaller cookies for baking. High quality comstruction, easy to grip color coded handle. A fraction of the cost of similar name brand products, and I can’t tell the difference. These scoops are perfect for scooping our mini cupcakes! We use these every day and they work great. None of them have broken. Great product! These are the only type of a "Disher" that I ever use because the other ones do not hold up to gig jobs. They scoop up so many things from cookies to ice cream. Love them! How did I ever make perfect size cookies without this scoop? I didn't. Sometimes I had 20 for a recipe that makes 24. Sometimes there were no 2 cookies the same size and that meant uneven baking of the batch. Not real heavy to tire out your hand. Nice smooth working mechanism. Made 2 big platters of deviled eggs for July 4th cookout. The fillings were all perfect and I could still bend all of my aging fingers! This was the perfect sized cookie scoop. I just started baking and I used to ball out the dough in my hands. It got messy and very sticky. I came across this website and love it. Other scoops are at least twice as much. This is also easy to clean! Fantastic disher. It can be used for things like potatoes or dough's. I use it for cookies. The #40 is good for small to medium medium sized cookies. This scoop is the right size for batter in mini cupcakes as well as for cookies. The cookie dough scooped with this disher comes out round and bakes evenly. It is also great to know the exact measurements of the scoop for dishing toppings on salads or into small containers. I love to bake since age 10, that is 56 years. I was always using a regular spoon when I baked. No more since I found out about these disher Makes l my cookies and other baking needs all the same size now. It cleans wonderfully and stores nicely in my baking drawer with other sizes I purchased from WEBSTAURANT...And the price!! wonderful. Great little scoop. The handle feels like great quality. The size is perfect for making cookies. I was able to make double the amount of cookies in the same amount of time! perfect size for mini cookies, i use this purple handled .75oz Disher for other small items like bite sized bisque. These Dishers are a great way to distinguishe sizes. 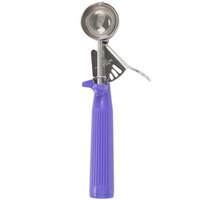 This purple disher is a great size and comes in handy for many things. My main use for it has been for baking cookies. Just the right size! This small dishes worker perfectly to distribute my cupcake batter into the mini cupcake pans. The purple color also makes it easy to differentiate the sizes with seeing the heads. Bought this ice scream scoop to evenly distribute dough throughout my baking batches although I still use a scale. I do like that it keeps my hands clean and the scoops relatively clean looking. I am looking into getting a smaller one for when recipes are looking for a 1 tbsp scoop for cookies. These really are just OK - they seem kind of cheap. And the clicker area tends to pinch hands and rip through gloves. I much prefer the Zeroll brand scoops which feel much more ergonomic and like they are meant to last. The first one got lost in shipping and webstaurant replaces it super quick. Great customer service. This is a good quality disher you can buy anywhere but webstaurant has the best price and service by far. This is the perfect size for cookies! Also if you only need a small portion of something. love it! Easy to use and easy to wash! A great little mini scoop. We use it for mini cookies, truffles, and adding a filling to our muffins. Holds up with heavy use, and a good price. I use these for meatballs so as to get the consistent size that I am looking for so as to be able to do large batches without over or under cooking any of the meatballs. PERFECTION! I like this purple disher because it scoops out the perfect amount of cake batter for my mini cupcakes. I also use it for my mini cookies. Makes perfect, even sizes. Hi, this Purple Disher works great! It makes our job in the bakery go much more smoothly. Thank you for making a product that works so well! love this scooper for my chocolate chip cookies. I make at least 300 cookies at a time and i always have perfectly sized cookies and i finish faster. I used this scoop this past weekend to make a batch of truffles. It made the job so easy and they came out the perfect size. I am so happy I purchased this and will probably order another for 2 of us to work at the same time. I love this pretty purple scoop. It makes perfect sized cookies. They all come out uniform with this scoop. The lever is easy to push and the dough comes right out. The 0.75 Purple #40 Disher is reasonably priced but lightweight. It is great for scooping cookie dough. It isn't recommended to place in a dishwasher. This scoop is decent. It is half the price of the regular scoop you find at local stores. So you get what you pay for. Great product and it gets a lot of use. Highly recommended. Would definitely order this product again. It works very well for Italian ices. Great price. The .75 oz. dished is just what is neeed for scooping cookie dough. The handle gives you a good size grip while the thumb releaserops the cookies in place with ease. I use this small disher to scoop a variety of things. It is perfect for super small scoops of ice cream, or melon, or cookie dough! This disher is great for portioning out small amounts. We use it for cookie dough, sour cream, salsa, dressings, shredded cheese, cream cheese, and lots more. I LOVE this scoop. I purchased it to use as a measure for my mini cupcakes and it is the perfect size. Plus its easy to operate. Great tool!! I wanted to make some cookies for my sisters wedding party. I started with the 1 oz scoop but decided that was a bit to big. This 0.75 oz scoop makes perfect normal size cookies, like the size you would want to make in your home. It is really easy to use seems nice and sturdy and it should last a long time. I'm really loving this scoop, I like to make a big batch of cookie dough then use the scoop, and scoop everything out and put some of the nicely shaped cookie dough balls in the freezer to be baked at a later time, or just eat frozen cookie dough that's good too. This is the perfect size for standard cookies. I use it for scooping a bunch of cookies out onto a tray before baking. It makes it so much easier. I also like to use it for making parfaits. Great disher with many uses, best for making cookies, as it is the best portion size for 12 cookies on half sheet. if they are cookies that spread. I ordered this scoop because it measures out the perfect amount for frosting on top of cupcakes (sometimes, I just don't feel like dealing with a piping bag)! It's easy to clean (just run it under the water immediately after use or soak in hot water for a couple of minutes and wash it by hand...no need to even bother with the dishwasher - caked on mess can get trapped in the lever). It's also heavy duty, and great quality. I've purchased plastic scoops in the past and they just don't hold up to heavy batters like muffins and biscuits after repeated use. This is a great buy! Can't beat the price. These dishers are amazing quality. Not good for lefties though. I would highly recommend them to anyone. We use this size for our madeleines and whoopie pies at our bakery. These are great. I have them in all available sizes. The color coding makes it easy to quickly reach for just the right one. They are perfect dishers for dishing out just the right amount. Each size serves a different purpose. This one is for measuring out just the right amount of batter for mini cupcakes. I love love love love love this cookie scoop! I use this scoop for my "mini's". I'm so in love with it. This scoop gives me 3-4 dozen of cookies for most batches. Perfect bite sized cookies, see my picture of them! We use this scooper in our bakery to scoop cookie dough. they hold up well even when scooping harder doughs. helps to keep our product consistent. I use this for my soft serve custard for my business when I cater weddings. Of course we can't bring our soft serve machine to all events so we just scoop it out and this scooper gives us cute little perfectly sized portions. This is a great disher for the price! It works well for dishing up batter into mini cupcake pans. It is also great for dishing cookie dough. I bought this disher to evenly portion out small cookies. It has been working well, and the mechanics haven't failed me yet. It's also good for shaping meat balls. this .75 disher is perfect for portioning out cookie dough and for making cake pops. it has made a great addition to our kitchen, is sturdy and very well made. Great size for making mini meatballs and portioning cookie dough. Easy operation does not hurt thumb. Easy enough to clean as well. You need a scoop with the automatic scraper on it! I purchased these for commercial training of high school students. The size is perfect for dishing salsa, sour cream, dressings into portion cups for service. The purple handles make them easy to identify among our assortment of dishers. Very satisfied with this purchase! This disher works greats! I use it to scoop cake pops. It has an easy release handle. I never have problems with the handle getting jammed nor with food getting left behind in the scooper. Comfortable handle. Very easy to clean. These are very well constructed scoopers. My intent is to use them for mini cupcakes, but I think there going to be too big. I wish they had a smaller size. This portion scoop has been great. No problems with it! Use it regularly to make macaroons and it has helped us with our portion control! Thought it was a volrath, but its made in China. That's fine though. Used this to make meatballs last week and it was durable and easy to clean. Speedy to use. I love this scoop it makes a perfect size cookie every time. Fast shipping great price I will definitely be ordering again and definitely recommend this product. Great, basic scooper. I use this one during the summer to scoop out balls of watermelon for my family. The design is great and the price is even better! Very sturdy, nice edge, and retains heat well for scooping ice cream. It is well-built, smooth release. The thumb press makes the scooping process fast and easy. A great scoop for a great price. Works well, it is the same quality as the other scoops we have purchased at other restaurant stores! Best disher for the price there is....We will definetly order this item again. It holds up to the use of our kitchen staff and has preformed outstandingly. A basic, cheap, 3/4 oz #40 disher. Not made for super heavy duty use, but it works. I wish Webstaurant Store sold a few smaller sizes of this style, as even the #40 can be a bit large for some baking/dishing/serving/portioning purposes. For smaller sizes you have to get the squeeze handle style for a little more money. Be careful scooping very firm things, as you can break that weld that connects the blade to the thumb lever. This is a great size for small meatballs.. And good for ice cream scoops of different flavors for children in the 4oz cups that I ordered from here as well.. I will try with cookie dough next. I have a few of these dishers in different sizes that I use for different baking tasks. I love the various colors - they make it easy to find the one I need (and add color to my kitchen). I use this small one for cookie dough. What an awesome little portion scoop. We use it weekly to make small crab cakes for our tapas style menu. It is good for any small portion control task in the kitchen. It is a great tool for consistency. Perfect for our use. We use this dishes to scoop portions of whipped butter for our bread baskets. Sturdy construction. No issues and good price, too! Good reliable scoop, the only problem I have with these is I am constantly getting food on my thumb by the handle. Not sure if it is just me. This #40 Disher is the perfect size for cookie dough. and mini crab cakes. It delivers accurate portions and easy to squeeze. The return blade gives dependable delivery. This size excellent for mini cupcakes. Love this item! I use it to scoop out cookie dough. It works smoothly and easily, is very sturdy, and makes all my cookies the same size. Will probably buy more in different sizes! I love this scoop. My family complained that my red scoop cookies were too big so I ordered the purple one and now they are just right. Great scoop! I like these much better than the stainless ones; they seem to hold up better in thick cookie dough. I use mine not only for cookie dough, but measuring sticky ingredients and shortening. These are the PERFECT size for cookies, and if you have hundreds of them to make, nothing is easier than scooping them out with this bad boy. The mechanism seems like its going to hold up for a good long time as well. Love my new #40 Pule 7/8-oz. Disher. It works perfectly to scoop the proper amount of batter into my donut pan. Comfortable to use, easy to clean. As always, great value from WEBstaurant Store. We have gotten some good use out of these. However, they only lasted about four months before the spring broke. Otherwise, a very decent product. We use this disher for scooping sour cream into our batter and for making our mini cupcakes. Its small, light weight, and gives accurate measurements each time we use it. This disher is so easy to clean! It makes very clean scoops. And the fact that it is purple, gives it that edge that makes it the best! I love all the dishers that I have gotten from this web site! This oner is my absolute favorite disher! I make hundreds of cake pops and this is the perfect size! Great scoop to have. Very durable and easy to clean. Good for scooping little mashed potato balls to cheese balls to scooping sorbet. This thing does it all. Again, these scoops are the best. Not only for our pantry for desserts, but our kitchen also uses the different sizes for their portioned items. Scoops / dishers are a huge time-saver in the kitchen when making large quantities of items. We use them for making small cookies and also putting batter in baking cups for minis. I have Dishers in multiple sizes for multiple uses. This one I use to make small Swedish meatballs and for balling fruit like cantaloupe and watermelon. Like all the other Items I have purchased from The Webstaurant Store, they have the best selection and price.